Summary: Ophelia Delphinium Fidgets is a fairy who has been trained to grant wishes. Problem is, the sense of wonder in the human world is dropping off, creating a shortage of the fairy dust required to make wishes come true. So Ophelia’s been biding her time since her training ended, fastidiously keeping up her skills until it’s her turn to visit the human world. Her chance comes at last, and she ventures forth to retrieve a nickel a girl tossed into a fountain, wishing for a purple bicycle. 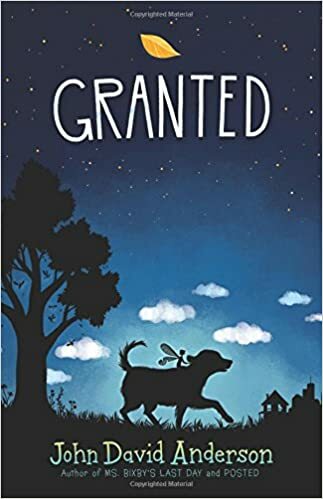 Sounds easy enough, but Ophelia’s best-laid plans are foiled at every turn, and she has to deal with airplanes, fire extinguishers, birds of prey, and a not-too-bright dog named Sam who thinks he’s her new best friend. Ophelia’s also distracted by a boy named Gabe whose path keeps crossing hers and who seems to have a wish far more compelling than a purple bicycle. When Ophelia is forced to choose between her original mission and Gabe’s wish, she shakes the fairy world to its very core. Can there be a happily-ever-after ending for both fairies and humans? 336 pages; grades 3-7. Pros: John David Anderson moves away from realistic fiction to create a detailed imaginary fairy world and a funny, slightly neurotic fairy heroine. Readers will find themselves thinking twice before pulling on a wishbone or tossing a coin into a fountain. Cons: The story didn’t really pick up for me until Ophelia left her fairy home and ventured into the human world.